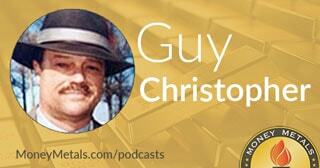 Coming up later in today’s program we’ve got a fantastic interview with MoneyMetals.com columnist Guy Christopher. Guy shares some helpful tips on how to talk to your family and friends about the importance of gold and silver, and offers up some of his other great insights as well. You won’t want to miss my interview with Guy Christopher, coming up after this week’s market update. For the third week in a row, the gold market traded up near $1,300 an ounce. And for the third week in a row, sellers came in to defend that major resistance level. Gold prices currently come in at $1,291, posting a weekly advance now of 0.3%. Silver also shows a small gain, up 0.5% this week to bring spot prices to $17.13 an ounce. Relatively quiet trading is taking place in both the platinum and palladium markets as well, with prices checking in at $984 and $935 an ounce, respectively. Elsewhere in the metals universe, copper is on the move. On Thursday, copper prices surged above $3 a pound to a three year high. Base metals are benefiting from recovering industrial demand out of Asia and concerns about limited global supplies. The mining industry nearly got obliterated by the bear market of 2011-2015. Whether it’s copper, nickel, gold, or silver, metals prices have only recently recovered enough to save more mines from closing. It will take much higher prices to actually bring new production online. Meanwhile, political uncertainty could help drive safe-haven demand for precious metals and weigh on the stock market in the weeks ahead. President Donald Trump is growing frustrated with the uninspired and legislatively unproductive leadership of Senate Majority Leader Mitch McConnell. This week Trump feuded with McConnell and other establishment Republicans. Trump told Congress that it must provide funding for a border wall in its bill to fund the government or else risk triggering a government shutdown. Threats of government shutdowns have happened so regularly in recent years that markets might take it in stride. But the calls on the left for Trump’s impeachment aren’t stopping. If Trump’s rocky relationship with Republican leaders in Congress worsens, that will only put his policy agenda – and possibly his presidency – into further jeopardy. Trump has few allies in corporate America. Silicon Valley is now pursuing what amounts to political content censorship online. First, they come for the alt-right… then they come for anyone to the right of centrist Mitt Romney. The concept of “de-platforming” people who hold political views that offend social justice activists first gained traction on college campuses. It spread to social media sites. Now social justice warriors are going after people’s finances. They’re getting individuals and organizations they don’t like de-platformed from the credit card processing system. Stuart Varney (Fox Business News): PayPal kicked Jihad Watch out. Said it could no longer raise money through them. Why? Because leftist groups said, Jihad Watch showed "Extreme hostility to Muslims." They equated conservative opinion with hate. Robert Spencer (Director of Jihad Watch): The thing about it is PayPal, just like the other leftist groups that were behind us, notably the Southern Poverty Law Center, they don't allow any appeal. They don't allow you to decent, to discuss, to debate, to explain. After much outcry from conservatives, PayPal restored the account of Jihad Watch. But many other groups remain blacklisted by PayPal and other online payment processing services based on their political views. Even the leading Bitcoin exchange Coinbase has succumbed to pressure to close accounts based on “hate” lists drawn up by leftists. Very dangerous precedents are now being set that threaten financial freedom as we have known it. Just a small number of companies have the technical ability to ban anyone they want from e-commerce for holding the wrong opinions. Outrage mobs are trying to retrofit the internet onto the “index card of allowable opinion,” as free-market economist Tom Woods puts it. They probably won’t succeed in doing that. But they can succeed in making it financially costly to be politically incorrect. The sudden emergence of online financial de-platforming serves as a warning against going completely cashless. Your access to the digital economy can be turned off by the corporations that control it. Even your ability to use digital crypto-currencies could be revoked. They are harder to control than credit card systems. But a future law aimed at combating so-called “hate speech,” or terrorism, or drug trafficking, or something else could force crypto-currency exchanges offline and relegate Bitcoin to the dark web. In the totally cashless society that bankers and government bureaucrats want to take us toward, people could become digitally purged from the economy. Those banned from using credit cards or smartphone apps would find themselves unable to buy anything. They’d be left to survive through begging and barter. This isn’t necessarily where the war on cash and the war on politically incorrect speech will lead. It’s where they could lead in a worst-case scenario. Other threats such as hacking and digital theft make it prudent for everyone to hold a significant portion of their wealth in tangible form. It’s not a bad idea to have a few hundred dollars in paper cash for convenience during an emergency. But physical precious metals are a superior long-term store of value and should make up the bulk of your tangible wealth stash. Mike Gleason: It is my privilege to bring in Guy Christopher now, one of our featured columnists on our MoneyMetals.com website. Guy is an investigative journalist and published author, but he's also a former stock broker and veteran of the 101st Airborne serving in the Vietnam War. All of this real world experience combined with his communication skills has helped provide our readers and customers with some really great insights. Since joining our team he's written some hard-hitting columns, even one or two that might have challenged you a bit. Guy, welcome. It's great to have you on with us today. Guy Christopher: Mike, thank you for having me. It's very kind of you. Mike Gleason: I want to talk to you about two of your recent articles in particular, the first one titled, "You and I Have No Right to Be Scared." In that piece, you give an illustration of just how bad things have been getting and how incredibly important it is to own precious metals given the current landscape; but even with all the events of the last 10 or 15 years, it can still be hard for people to overcome that first psychological hurdle. Guy Christopher: I guess psychologically it might have to do with being inside of a crowd, it's easy to do things when the crowd is going along with you. My feeling when I was first buying gold and silver, which was about 10 years ago, I was all alone and I felt all alone and I couldn't go to friends and say, "Oh, look what I paid $800 for or $600 for." When I did, once or twice, I got strange looks and like, "Whoa! What are you wasting your money on that for?" So I had to rely on my own instincts that I was doing the right thing. There wasn't a big crowd of folks standing there with me and there wasn't a crowd of folks or a line of folks behind me if I decided I made a mistake and needed to turn around and sell it; there was nobody to sell it to. Mike Gleason: Certainly, the world has changed a tremendous amount since then and we've got governments that are just spending money like nobody's business here and the dollars continue to get devalued. Precious metals are just an extremely important part of a person's personal financial strategy, is it not? That's certainly one of the main reasons I think you're in the camp that they were in here…you've got so many reasons out there to own it. Like you said, there's no reason to be scared, given everything that we've got, it's a scary proposition to not own any precious metals, right? Guy Christopher: Well that’s right. The world was not as scary 15 years ago as it is today. Fifteen years ago we didn't know of all the horrors and manipulations that we are going through today. The government, the political structure, trillions and trillions of dollars in debt that we didn't have to deal with back then, but there were indications and it was those indications that helped those folks who bought gold and silver early on. It was their instincts that the indications were pointing to bad things coming and then guess what; bad things did come. Mike Gleason: How did you come up with the idea through this column? Was it based on a real experience you had, perhaps or what was the driving force? Guy Christopher: Yes. I'm happy to tell that story. I was out on a meeting that ran late one night and as I was leaving in the meeting, two ladies, married, children, approached me and said, "We heard you say something gold and silver. We’d like to take you to lunch." And I said to them, "How about I take you to a coin convention." We had one coming up in the area about a week later. Now coin conventions, the name is coin convention but obviously there's a lot of bullion being sold at coin conventions. I met these gals at the show that following weekend and walked them through the show. It's an interesting thing to walk into a hotel ballroom with $50 million on a table in gold and silver. We spent about an hour meeting people and looking at the displays and I was explaining this is a roll of this and this is a bag of that. They'd never really noticed 90% silver, they didn't know what a bag of 90% silver was. They'd probably never seen a Silver Eagle or a Gold Eagle bullion coin for that matter. Mike Gleason: That leads me to my next question here and then we're going to move on to the one of the other columns you penned for us, one titled, "What to Expect When Telling Friends About Gold and Silver." You've mentioned a success story there but we often run into a lot of opposition and I don't know if it's my imagination here, but it seems like most people are programmed to turn their nose up at gold and silver as either risky or wacky or somehow a stupid thing to own. Why is that, do you think? Guy Christopher: It's simply because Americans have been conditioned to see money, gold and silver, credit cards, dollar bills in a way that is unhealthy, financially and monetarily. For the last eighty years, the government has been pretty successful in drumming gold and silver out of the American psyche. They replaced it quite easily, I think too easily, they replaced the constitutional money, gold and silver, they replaced it with credit cards, they replaced it with debt. Mike Gleason: I think we can all relate to the struggles of trying to get the point across and if you’ve got your conviction then don't lose that and just continue to fight a good fight, I suppose. I really do believe like you do that it's incredibly important that people have some sort of protection against what may be coming and a collapse in paper that seem somewhat inevitable, so we certainly want to continue to share the gold and silver story with folks who have not heard it or don't seem to buy into it just yet. Guy Christopher: We could start with Ben Bernanke who told Ron Paul a few years ago in Congressional hearings that Ron Paul asking, "Is gold money?" and he said, "No, it's an asset, but it's not money." That is the official line from the government but the truth is that governments know a darn well that gold is money. We know that because they hoard gold and they sell gold and they do it secretly and they won't tell us anything about it. It's been for quite a few years since we've had a proper audit of Fort Knox. 1953 was the last credible audit of Fort Knox and the reason we can't get any hard information on where the gold is and who owns it is because the government doesn't want us to know about it. The government prefers that we see the dollar bill as money. The dollar bill is debt. There's nothing backing it except full faith in credit and that full faith in credit right now is on the edge of the cliff as we all know. Mike Gleason: Definitely something people need to be very mindful of what’s happening on that front. Well Guy, great stuff. Thanks very much for your insights. I have to say that I personally have really enjoyed your writings and look forward to reading more, as well as having you discuss those with our audience here. So keep up the good work and hopefully we'll talk with you again soon. Guy Christopher: Mike, I appreciate the opportunity to share some of these thoughts with. Thanks for your invitation. Mike Gleason: Well that will do it for this week. Thanks again to Guy Christopher, Money Metals columnist. Check out his work at MoneyMetals.com and tune in next Friday for our next weekly Weekly Market Wrap Podcast. Until then, this has been Mike Mike Gleason with Money Metals Exchange. Thanks for listening and have a great weekend everybody.